Elizabeth I (1558-1603), fine gold Ryal of Fifteen Shillings, Tower Mint, Queen Elizabeth standing in Tudor warship sailing left, holding orb and sceptre, rose on hull, E on banner at bow, Latin legend and beaded borders surrounding both sides, ELI ZAB; D; G; ANG; FR; ET. h IB REGInA. rev. rose on sun with sixteen rays at centre, cruciform cross fleury ends with lis terminal surrounding, crown over lion in each angle, all within a tressure of eight arcs, small trefoils in spandrels, initial mark escallop (1584-86), IhS; AVT; TRAnSIEnS. PER. mEDIV; ILLORVm. IBAT. weight 7.54g (Schneider 785; Brown and Comber B6; N.2004; S.2530). Toned, a little weakly struck in stern portion of boat and sea and corresponding part of reverse, one light crease, otherwise good very fine and extremely rare. The abbreviated Latin legends translate as on the obverse "Elizabeth by the Grace of God, Queen of England, France and Ireland"; and on the reverse "But Jesus, passing through the midst of them, went His way" taken from the Bible. 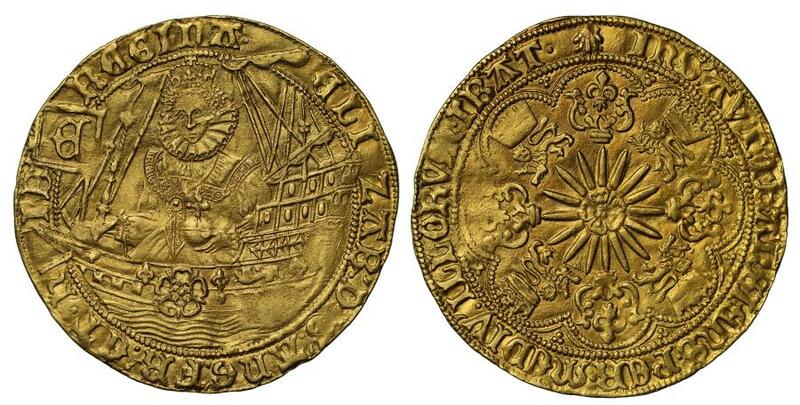 The Gold "ship" Ryal or Rose Noble of Queen Elizabeth I of Fifteen Shillings face value is one of the rarest and most desirable coins of this reign. The denomination represents one of the last coins struck in the mediæval design styled with full Lombardic lettering. These coins were issued by order of a Privy Seal Warrant of the 20th April 1584 authorising the striking of fine gold Nobles of Fifteen Shillings (Ryals) and Double-Nobles of Thirty Shillings (Sovereigns) in order to help finance the Earl of Leicester's expedition to the Netherlands in 1585. By the 31st January 1586/7 a total of £27,936 worth of these two denominations had been struck of which only 3,000 were Nobles like we have offered here. They are extremely rare today and Brown and Comber only traced twelve examples extant to collectors in their article of 1989, to which not many more can be added since. Ex Mark Rasmussen Numismatist, List 8, item 124 and list 11 (2006) item 46.